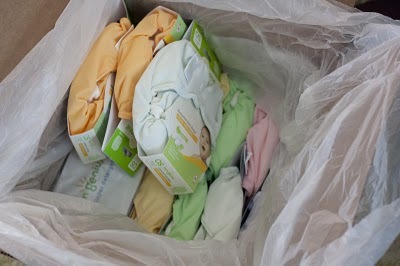 Eva's new diapers arrived on Monday, so we have been trying them out for a couple of days. 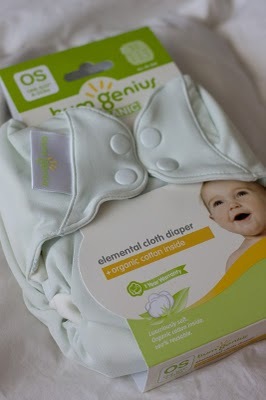 I settled on these Bum Genius Elemental diapers. One-size (so we don't have to keep buying them as she grows), all-in-one (because you all advised that this was the handiest option—thanks! ), and organic (not the reason I bought them, but a nice bonus.) For the most part, I like them. 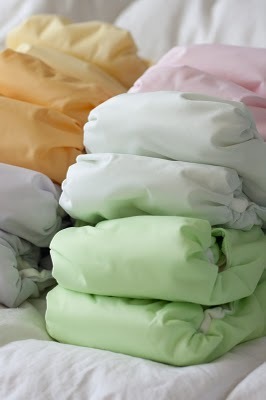 They are easy to use, and they clean well in my washing machine. I even like using the cloth wipes. Easy peasy. They come in a lovely array of colors. (They look pretty cute all strung out on the line!) I'm afraid I'll need a few more than 12, however, if I go for this long term. And, they are pretty stinkin' cute on my chubby baby, I have to say. But, I have one (not-so-minor) complaint. I'm not sure Eva likes them. The last two nights she has woken up every 2-3 hours, which is no picnic after she has been consistently sleeping for 5-7 hours straight a night. She isn't napping as well during the day either. I'm thinking these don't whisk the moisture away as well as disposables and she might find them a little bulky/uncomfortable. Anyone else have this problem? I am going to try disposables tonight and see if it makes a difference. If it does, I'll trade off a few more times just to make sure that is what is causing her to wake up. In any case, the jury is still out on whether or not this is the solution for us. I'll keep you posted.